Lucknow’s Swarangi Shukla have topped the results while Delhi’s Vinod Joshi bagged the second rank. The UPPSJ-2016 results were declared on UPPSC’s official website uppsc.up.nic. 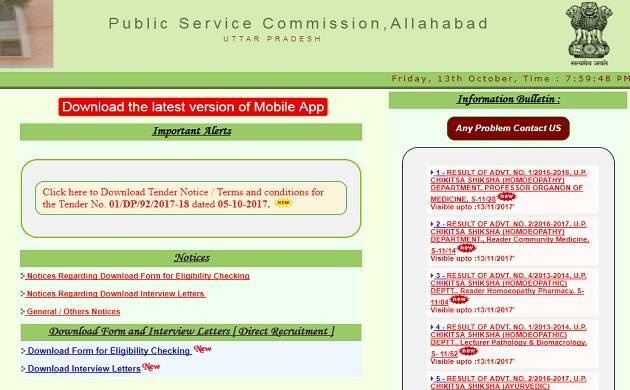 The Uttar Pradesh Public Service Commission (UPPSC) on Friday declared the results of Civil Judge Junior Division (PCSJ -2016). Lucknow’s Swaraangi Shukla have topped the results while Delhi’s Vinod Joshi bagged the second rank. The UPPSJ-2016 results were declared on UPPSC’s official website uppsc.up.nic. A total 218 candidates have passed the examination and those who appeared in the exam can check their results by visiting UPPSC's official website uppsc.up.nic. # There will be a results section on the right side of the website. # Click on the "Click to continue" option. # Click on the link given in notification no 8. # A list of U.P. JUDICIAL SERVICES (CIVIL JUDGE) (Jr. Div.) EXAM. 2016 candidates will open. # Check your name in the list. PCSJ 2016 Examination was held on December 18, 19 and 20 in 2016 at various centres in Lucknow and Allahabad. A total 670 candidates were qualified for 218 posts of JUDICIAL SERVICES (CIVIL JUDGE) (Jr. Div. ).